Along with the likes of Jack The Ripper, Charles Bronson and the Great Train Robbery, the legend of the Kray twins is something that has always been of great fascination to the British public. Though I am unaware of the extent of their notoriety outside of the British Isles, stories and memories of Ronald and Reginald Kray are something that has spawned many a television documentary and on screen adaptation in the years since their downfall, most notably the 1990 film The Krays starring the Kemp brothers of Spandau Ballet fame. 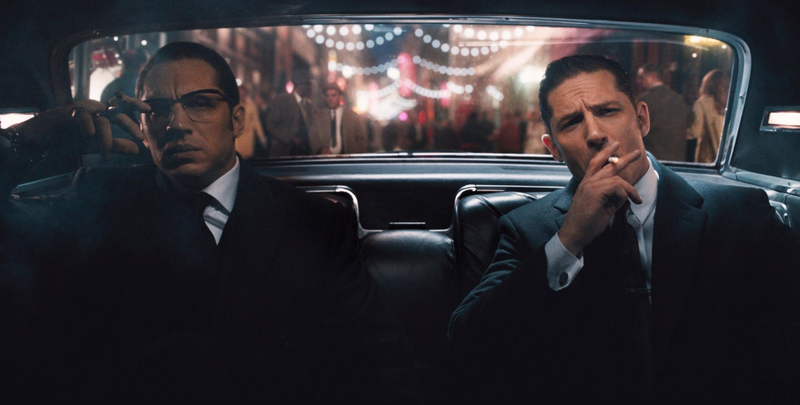 With this twenty five year old cinematic offering now looking extremely dated, filmmaker Brian Helgeland has taken it upon himself to write and direct Legend, an updated version of the Kray twins tale with an unusual and very brave casting decision. 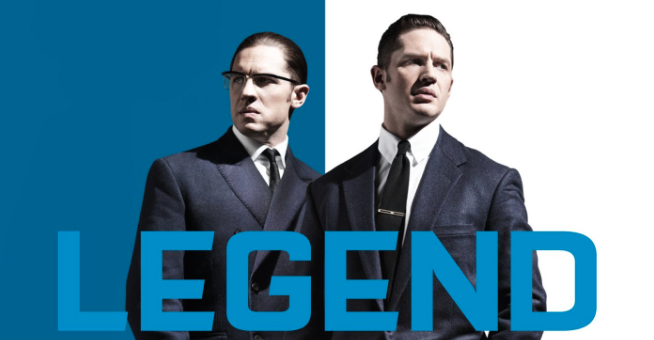 Legend is not a complete story of the Kray twins lives from childhood to death, but instead gives the audience an insight in to the most prominent years of their lives dominating the East End of London during the 1950s and 1960s. In a display of genuinely extraordinary acting, Tom Hardy gives a duel performance as both Reggie and Ronnie, with the film’s core thread being Reggie’s troubled marriage to Frances Shea (played by Emily Browning) and his continual attempts to curb the unpredictable and increasingly dangerous behaviour of brother Ronnie, a certified paranoid schizophrenic who often refused to take his medication. The film provides little new information for those who are already well versed in the brother’s exploits, but there is great enjoyment and engagement to be found in plot threads including Reggie’s unsuccessful attempts to go straight, Ronnie’s unreserved and unashamed homosexuality, the twin’s dealings with the American Mafia, and the murders of George Cornell and Jack ‘The Hat’ McVitie that eventually lead to their capture and subsequent life prison sentences. Though these acts of violence and insights in to the world of organised crime are of course necessary, the real heart of the film is found not in action sequences but in the relationships between Reggie, Ronnie and Frances, a tangled web of broken promises, misplaced loyalties, and jealously. The choice to focus on these emotional issues and getting underneath the ‘legend’ of the Krays really serves to provide a humanising touch to a story that so many think they know inside out, and though, of course, the bulk of this personal drama must be the product of speculation and insider information, the narrative feels authentic and credible. I have read a number of critics chastise the film for glamourising the life of crime that the brother’s lead for so many years, but I have to say I did not read the picture that way at all. Sure, they may have had money and they may have demanded huge amounts of respect from their peers, but the point of Legend, in my opinion, is to show us that beneath the expensive suits and the almost celebrity status that they enjoyed, the personal lives of the Kray twins were a whirlwind of chaos and unhappiness brought on by a tragic mental illness on Ronnie’s part and a tragic familial bond that could never be broken on Reggie’s part, no matter how damaging and detrimental it could be. The decision to cast one actor to play both Ronnie and Reggie was a risky and potentially gimmicky road to take, but in the hands of Tom Hardy is turned out to be a true work of cinematic genius. My initial worry was that I was going to be too distracted by it to be able to enjoy the film, but the truth is that after the first ten minutes I had completely forgotten that both brother’s were being played by the same man. As Reggie, Hardy exudes an irresistible charisma that perfectly encapsulates and explains just how successful the man was both as a club owner and a no nonsense gangster. Something of a carefree, confident chap in the opening scenes as he courts the young Frances and enjoys his East End notoriety, we physically begin to see the weight of Reggie’s responsibility with regard to his out of control brother begin to wear him down, and Hardy effortlessly captures this change in mood and personality as the ‘years’ go by. Though arguably the secondary brother in terms of the central plot, it is as Ronnie that Hardy provides many of the film’s most memorable moments. Giving a completely different yet simultaneously eerily similar performance, Hardy is wonderful as Ronnie, a man who very much sees things in black and white. He either liked you or he didn’t, he was either going to beat you to a pulp or he wasn’t, and the unpredictable menace of the character provides for some truly tense set pieces. It seems bizarre to talk about on screen chemistry between two characters played by the same actor, but there really is an unbelievable partnership and relationship between the two characters, made more impressive when you consider the fact that Hardy will have had to perform each scene twice, unable to react to a co-star in the way that most films allow. Great performances are also given by Emily Browning as Frances and David Thewlis as the brother’s financial advisor Leslie Payne, but the fact of the matter is that Tom Hardy and Tom Hardy alone elevates the film from being a stylish but slightly run of the mill biopic to something that really quite special. Overall, Legend is a great British crime thriller that is made even greater thanks to an innovative and inspired casting decision. The captivating, stylish and hard edged story of the notorious Kray twins, for me, at least, is always going to peak interest, but the more human, personal side that Brian Helgeland’s film explores makes for a more nuanced and layered interpretation that one might expect. Tom Hardy is sensational in both of his character capacities, commanding the screen and leaving me bemoaning the end of a picture that was already over two hours on length. I expected to like it, but I did not expect to absolutely love it. Highly recommended. Hoping to catch this later this week and I can’t wait.